The Humble Administrator's Garden is the most famous of the south-eastern gardens; the very best of the East Wu Kingdom, and one of four great Chinese gardens-a classical Suzhou garden.The Humble Administrator's Garden is situated in Dongbei Street, Inner Dongbei Loumen, in the old city area of Suzhou. The garden occupies 4.1 hectares (not including administration area and flower nutsery, which occupy approximately 0.67 hectare). In the fourth year of the Ming dynasty's Zhengde period (1509 A.D.),the Emperors' envoy Wang Xianchen started to build it. During the next 400 years, following dynastic changes and different owners,through splendour and decay, the garden developed from formingone entity into separating into three gardens all with their own style. The Humble Administrator's Garden during the early times of Wang Xianchen's ownership has been documented by Wen Zhengming; he made sketches and notes which exist today. These notes describe in some detail the garden's appearance and style. At that time the garden's area was approximately 13.4 hectares-quite large. There were 31 scenic spots altogether, with a lot of bamboo, mountains, waters and trees, etc. ; resemling nature and giving an air of naturalness. 120 years later, in the fourth year of the Ming dynasty's Chongzhen Period(1631 A.D.), the already slightly decayed eastern part of the garden was owned by the aide Wang Xinyi. Wang was very good at mountain and water painting, and he therefore designed and arranged such landscapes. He named the garden "the Pastoral Garden Home". During the early Qianlong period, the western part of the Humble Administrator's Garden split into a middle and a western garden. The present West Garden was established during the third year of the Guangxu period (1877 A.D.); it was rebuilt by Zhang Luqian; he named it "Rebuilt Garden". This garden contained the sceneries of the Stay and Listen Pavilion, the "With Whom Shall I Sit? "Pavilion, the Floating Green Pavilion, etc. There were the 36 Pairs of Mandarin Ducks' Hall and the Hall of 18 Camellias newly built; beautifully and exquisitively decorated. The Middle Garden is the most distinguished part of the Humble Administrator's Garden. It has experienced many changes throughout the dynasties and is now different from the early Humble Administrator's Garden; the garden is based on water, and there are many rockeries grounded in the ponds. Surrounding the ponds there are numerous pavilions, terraces, halls and studios. 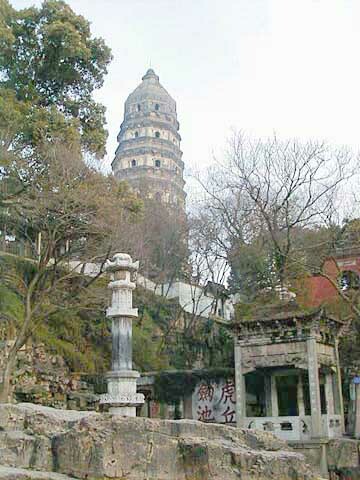 Basically it has preserved its structure from the Ming dynasty, and the sceneries have not gone through many changes. The appearance of the Middle Garden took shape in the Xianfeng/Guangxu periods of the Later Qing dynasty. 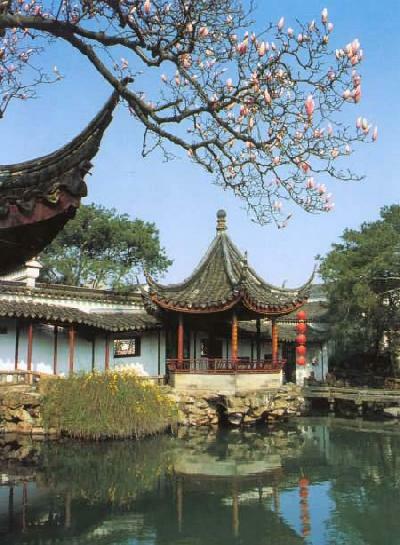 The art of the Humble Administrator's Garden has a prominent position in the history of China's garden creation. It represents the historical characteristics and achievements of south-east China's private gardens.